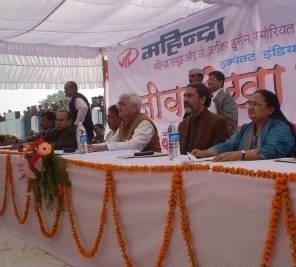 Farrukhabad, December 11, 2010: The Mahindra sponsored Life Line Express project successfully concluded in Farrukhabad, Uttar Pradesh today. Mr. Salman Khurshid, Hon. Minister for Corporate Affairs and Minority Affairs, was the Chief Guest at the closing ceremony. Other dignitaries present included Mrs. Louise Khurshid, Chairperson of the Dr. Zakir Husain Memorial Trust, Mr. Rajeev Dubey, President (Group HR & After-Market) and Chairman of the CSR Council, Mahindra Group and Col. R.S. Vishwen, COO of the Lifeline Express Project. The project was inaugurated on November 19, 2010 and has treated 1823 patients in a span of 21 days. Conditions treated included operable orthopaedic disabilities (post polio deformities), hearing related disorders, cleft lip, dental and eye related operable disabilities. “I would like to thank Mahindra for bringing this excellent initiative to Farrukhabad. The Life Line Express has made a significant difference in the lives of those suffering from avoidable disablement in this region. These kinds of initiatives are possible when the private sector joins hands with the public sector, when they want to share the pain of the people,” said Mr. Khurshid. “Mahindra is thankful to everyone specially, Mr. Salman Khurshid, Dr. Zakir Husain Memorial Trust and Major S. Singh college for giving us the opportunity to conduct the camp in Farrukhabad.” said Mr. Dubey. The Lifeline Express, the world’s first hospital on rails, is an initiative against avoidable disablement. Avoidable disablement has been on the national agenda for decades, highlighted by the suffering of those in rural India where medical services are scarce or nonexistent. The Impact India Foundation launched this project in 1991. The Life Line Express offers medical and surgical interventions to the differently abled in remote areas, free of cost. The train consists of five fully air-conditioned coaches, equipped with the most modern medical apparatus. This is the fourth time Mahindra has lent support to the Life Line Express project. In 2007, the company’s Farm Equipment Sector helped bring the train to Rudrapur, while in 2008, the Automotive Sector and Mahindra Finance sponsored the project in Rangia, Assam. In January 2010, the Farm Equipment Sector and Mahindra Finance joined hands to bring the Train of Hope to Wardha in Maharashtra. Mahindra & Mahindra Limited, Dr. Zakir Husain Memorial Trust, Farrukhabad, Impact India Foundation and Major S. D. Singh Medical College and Hospital, Fatehgarh have come together to support this initiative. The medical and paramedical staff from Major S. D. Singh Medical College and Hospital, Fatehgarh also volunteered their services for this humanitarian cause.